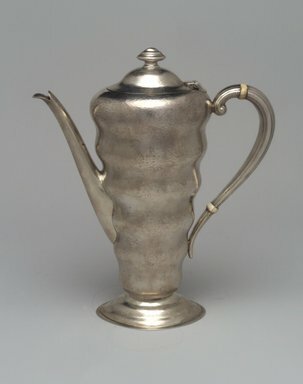 Silver coffee pot with ivory accents; part of four-piece set with sugar bowl, creamer, and tray (1994.205.12-.14). Downward tapering cylindrical ovoid body, with regularized undulations. Applied C-shaped handle with narrow ivory or bone insulators. Applied spout. Body rests on stepped, slightly domed ovoid base with slightly flattened rim. Hinged ovoid lid. Gold wash on interior.